Weekly Planner Spread: Is There Too Much Weekend? 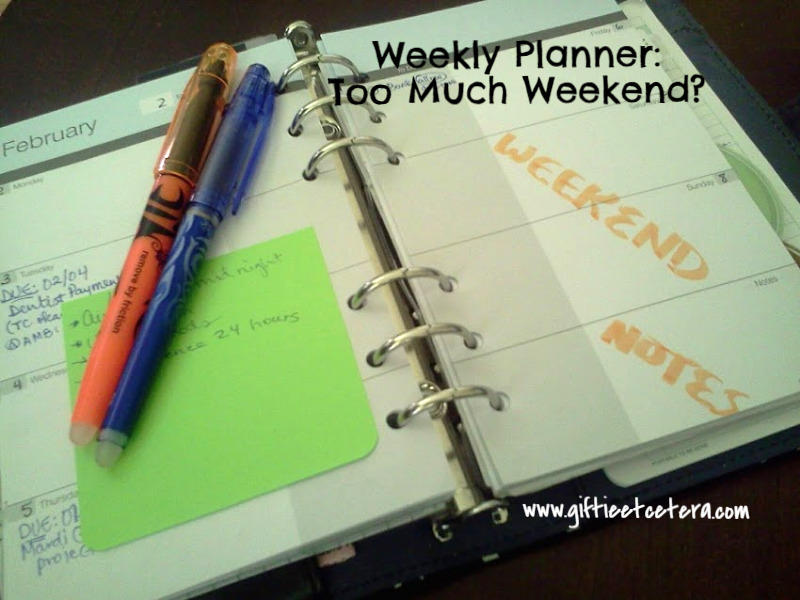 | Giftie Etcetera: Weekly Planner Spread: Is There Too Much Weekend? I never have too much weekend. Bring on half day Fridays! Bring on Monday holidays! I'll take it all - and I'll love it. But my weekly planner spread might have too much weekend on it. This picture shows just how much of the spread is dedicated to weekends. In sum, about half on one page - roughly 25% - of the weekly two-page spread is saved for weekend tasks, even though most weekends are spent at events (like dinners or parties) or doing routine chores (listed elsewhere). I've been tracking my writing in my planner over the last few months, and while Monday through Friday is usually close to full, with a daily docket often used because I have so many things going on, weekends generally are light (other than, of course, watching Downton Abbey). Weekends are, in fact, barely filled at all. I'm thinking of converting the inside grey box of Saturday and Sunday to a weekly lunch and dinner menu planning space. I'm not sure that my brain can deal with that (or relearn how to use the space, frankly), but I hate the menu at the very top (too horizontal), need the menu on the weekly spread, and use all of my notes space some weeks. What do you think about this idea? Anyone have other ways that they use extra weekend space? 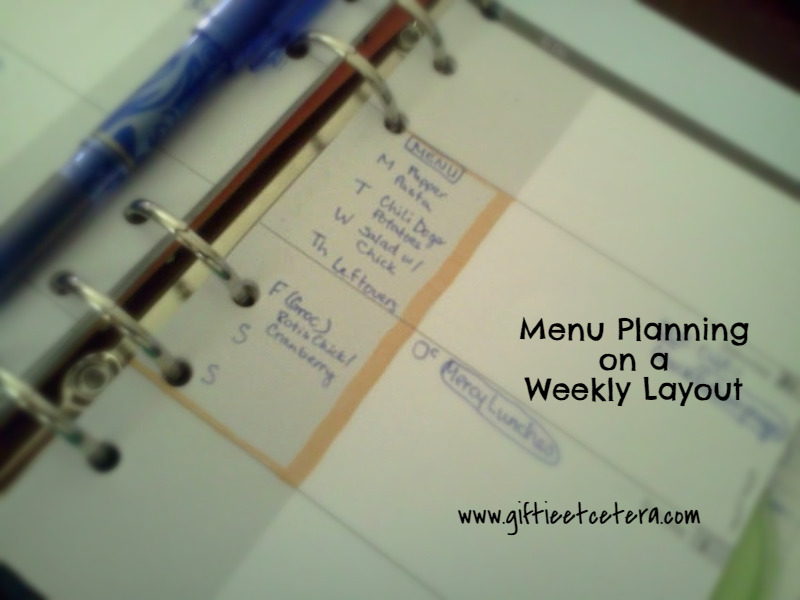 If your weekends are consistently light, then using that section for a meal planner is a great idea. You could always use a docket if you had a busy weekend day. My weekends are usually quite full especially Saturdays. But I think using the weekend space for meal planning is a great idea. My weekends are very busy - both work and family. But what falls on weekends is less routine, so I need my planner even more to use the time effectively. Otherwise Monday morning rolls around and too much got carried over. If I had the time, I'd design a M-F week layout for the routine part of the week, and then a separate layout for Sat/Sun. But if you're not using that space, absolutely repurpose it.